Last Friday night Tyrone Brunson stopped Manny Woods to win the UBF International Junior Middleweight title after eight-rounds of a scheduled ten-round bout in front of a sold out crowd at the 2300 Arena. The exciting 12-bout card was promoted by King’s Promotions. Brunson of Philadelphia systematically broke down woods as he boxed well using a pinpoint jab over the first half of the fight. In round six, Brunson started landing hard power punches and began to stagger Woods. Finally after round eight, the corner of Woods pulled the plug on the bout, and Brunson scored his 3rd straight win. Brunson is now 26-6-2 with 24 knockouts. Woods of Saint Petersburg, Florida is 16-7-1. In the co-feature Brandon Robinson scored the biggest win of his career by winning an eight-round unanimous decision over Christopher Brooker to win the UBF All Americas super middleweight title. Robinson got the better of the action as he cut Brooker in 2 places around the left eye. Brooker tried to get back in the fight over the last couple rounds, but it was Robinson’s boxing and power punches that propelled him to the victory by 80-72, 79-73 and 78-74. Robinson of Philadelphia is 8-1. Brooker of Philadelphia is 12-5. Jaron Ennis took out George Sosa at 1:09 of round two of a scheduled eight-round welterweight bout. The top prospect, Ennis scored two knockdowns and the fight was stopped at 1:09 of round two. Ennis of Philadelphia is now 17-0 with 15 knockouts. Sosa of Reading, PA is 15-11-1. Omar Douglas made short work of Isais Martin Gonzales by scoring a 1st round stoppage in a scheduled six-round super featherweight bout. The time of the bout was 1:52 for Douglas of Wilmington, Delaware, who raised his mark to 18-2 with 13 knockouts. Gonzales falls to 22-10. Kyrone Davis won an eight-round unanimous decision over Jamie Barboza in a middleweight bout. Davis of Wilmington, Delaware took all cards in shutout fashion (Barboza was deducted points on two occasions) by scores of 80-70, and he is now 13-1. Barboza is 19-13. Joe Hanks won a six-round unanimous decision over previously undefeated Joel Cauldle in an entertaining heavyweight bout. Hanks landed the harder shots and was more active against the game Caudle. Scores were 60-54 twice and 58-56 for Hanks, of Newark, NJ and he is now 22-2. Caudle of Raleigh, North Carolina is 7-1-1. Marcus Banks boxed very well for five-plus rounds and then finished off Antonio Rodriguez in the 6th and final round of their super bantamweight bout. A body shot dropped and stopped Rodriguez at 2:37 of round six, and Bates of Washington, DC is now 8-0-1 with seven knockouts. Rodriguez of Mexico is 11-20-1. Colby Madison survived a 1st round knockdown to come back and stop Randy Easton with a body shot at 2:44 of round two of their scheduled four-round heavyweight bout. Madison of Owings Mills, Maryland is 5-0-1 with 4 knockouts. Easton of Sunbury, PA is 4-10-2. Romuel Cruz made a successful pro debut with a 3rd round stoppage over Rondarrius Hunter in a bantamweight bout. A series of body shot put Hunter down and the bout was stopped at 2:#5. Cruz of Philadelphia is 1-0 with 1 knockout, Hunter of Atlanta is 1-2. 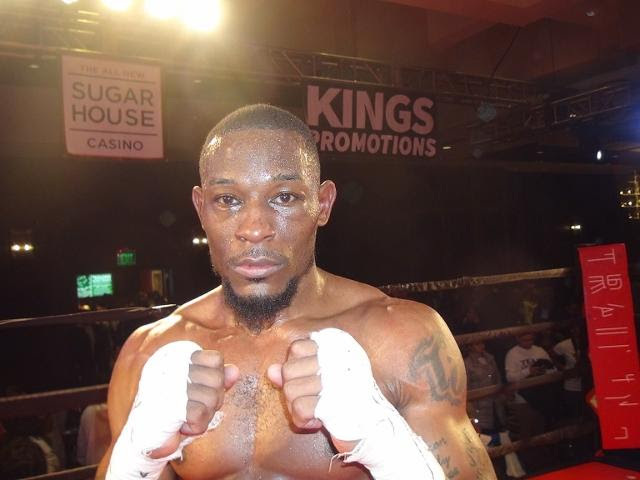 Rasheed Johnson of Philadelphia won a four-round unanimous decision over Kashon Hutchinson in a welterweight bout. Scores were 40-36 twice and 39-37 for Johnson, who raised his mark to 3-1. Hutchinosn of Reading, PA is 3-4. Shamsuddeen Justice stopped late-replacement Jack Grady at 2:07 of round one of their welterweight bout. The time of the finsh came at 2:07 for Justice of Philadelphia, who is now 2-0 with two knockouts. Gardy of Buffalo, NY is 0-7-1. Gerardo Martinez won a four-round split decision over Christopher Burgos in a lightweight bout. Martinez took took cards 39-37 while Burgos won a card 39-37. Martinez is 2-0. Burgos is 0-2.